In a world where “social media” is at every turn, it can be hard to gain perspective on the who, what, when, why, how, and how often of this powerful business tool. Luckily, there are people who not only “get by,” but excel in building successful media campaigns, and we’ve had the opportunity to watch and learn from these experts to help boost our PR strategies. The Stasko Agency recently had the pleasure of sitting down with THE LinkedIn Rockstar, Mike O’Neil. 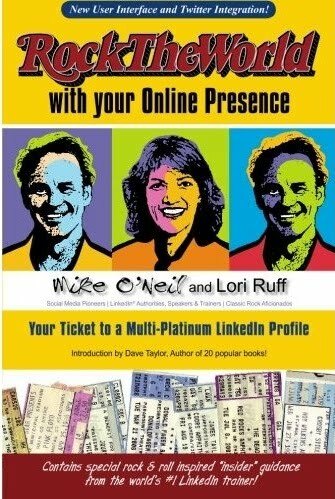 Mike is a social media expert and the author of his very own LinkedIn-related book, Rock the World with your Online Presence: Your Backstage Pass to a Multi-Platinum LinkedIn Profile. With over 1,000 concerts under his belt and 10,000 hours of LinkedIn and social media experience, it’s no wonder how Mike earned his title. Mike ranks 27th in all of LinkedIn for his number of connections, which is over 25,000. (Note: the max is 30,000). His partner, Lori Ruff, ranks 9th of all women on LinkedIn. And each have 30k + followers on twitter as well. Realizing a growing need for social media done right, Mike and Lori are spreading the love by teaching eager learners how to build their profile, grow their network and connect with the right people. In fact, the dynamic duo has an event coming up on March 10th that still has some spots open. If you know that building your social media presence is something you need to do, but don’t know where to start: this is it. Social Media Experts Mike O’Neil and Lori Ruff offer a Linkedin Training Clinic on Creating your own Multi-Platinum LinkedIn Profile. Cost: $89 includes autographed book! (Tip: use the discount code “rockstar” to receive $20 off) This is fantastic value for what you will be receiving. “Hands-On” means you’ll actually get time during the seminar to implement the tools and suggestions you’re given in the training to build your profile then and there. Bring your Laptop! In the meantime, take some time to connect with Mike and Lori online to see what they are doing and how they are building their networks. Restaurant Week & Root Down Don’t Forget to Spring Forward!